There are two other prose poems in this volume – Dear Future Lover and Dear Birdhouse, each written as letters. The form may seem easy to compose in, but I believe that it is difficult to sound convincing. There are also questions over the legitimacy of the form, which was introduced by Gertrude Stein, early in the last century. But I believe it to be a legitimate poetic form. The differences between it and a block of prose are subtle, but when read aloud it is unmistakably poetry. And Percy provides us with three fine examples in this volume. Ars Poetica is a wonderful sonnet, using the theme of composing to create a feeling of sensuousness. This is such an inventive approach as well as being daring. It seems to be based on the Petrarchan sonnet though the structure is slightly altered with the volta– “I might not” – placed on the ninth line rather than the eighth. It is a simple but effective devise which allows us to glide from ‘The courage of the night makes my ink flow faster’ to ‘The pen stops resisting my fingers’ (the opening lines of each stanza) without any awkwardness that sometimes occurs in sonnets moving from one ‘theme’ to another. This suggests to me that Percy has studied the sonnet form enough to accomplish her own approach to it. It is an intelligent approach to this Italian style, which originally dealt with formal themes. We are left wondering if the sensuousness of composing is indeed formal, yet the free verse approach suggests otherwise. Percy operates within a free verse which allows her to deal with various themes both formal such as the beautiful All Shall Be Well And All Manner Of Things Shall Be Well (St Julian of Norwich) and the informal When I Am Freewheeling, Lost. feeling the granite will float like dandelion seconds. There is so much control in this stanza; it reminds me of Plath in the way that each line is so well measured, as to take to that very emotion, hanging there like dandelion seconds. night scent of freedom and terror. Again skilfully measured lines to allow the reader to feel what the poet is describing. There is something generous about such an approach. The poet is allowing the reader to share an experience rather than read the lines and that’s it. And that sense runs throughout this volume. Percy understands what a poem should do: it should engage the reader/listener. There is no sense of distancing between the poet and the audience in these poems; no feeling of exhibitionism. The poems are not written as much as crafted and that is sadly a rare thing these days, to find poets who take the art seriously. There are good poets out there, who know their craft; who work at it and who go to open mic nights to get their work known. Then there are the exhibitionists; who think that all you have to do is shout loud enough, preferably with a required amount of expletives, about the latest government policy and how much they hate the Tories and they will be applauded, because they are saying what the audience already knows. They will get the pats on the back and have their egos massaged.Then there are those who treat the open mic night as a counselling session. Equally egotistical, their raison d’être seeking pity or some other such emotion from the audience. But the real poet; the real artist, will want to bring something to the audience that challenges them; that provokes them to think. Something that will take them out of their everyday lives and transport them to another place. They will not ask for anything for themselves because it is the poem that is the important thing. There are a few of those out there. 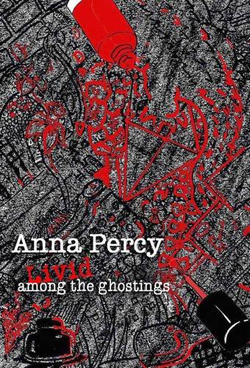 From this excellent collection, one can sense that Anna Perry is such a poet. Livid Among The Ghostings is avaialble to buy from Cornerhouse, to order through most bookshops and available direct from the publisher at http://www.flapjackpress.co.uk/page12.htm.